Wear Eva Flirt Deodorant to get noticed. Keeps body odour at bay for long time. With its moisture formula this deodorant provides necessary nourishment to the skin and makes it soft, smooth. Also due to its alcohol free nature it does not harm your skin. Prevents body odour and keeps fragrant for whole day. It leaves you with a cool sensation and a relaxed feel. Additional Information:Eva brand is part of TTK Healthcare and it consists personal care products like deodorant, skincare, talc. The products are developed after intense research to provide consumers with exceeding quality. 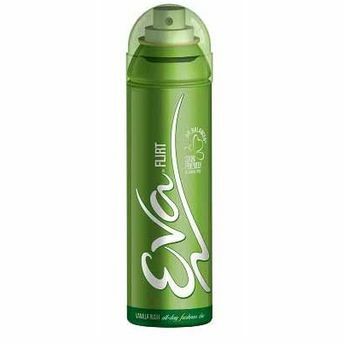 Eva Flirt Deodorant keeps you active and fresh for all day long. Explore the entire range of Deodorants/Roll-Ons available on Nykaa. Shop more Eva products here.You can browse through the complete world of Eva Deodorants/Roll-Ons .